MNA – Foreign Minister Zarif said Wed. that the IAEA’s inspections of Iran’s nuclear facilities cannot be used as a pretext to learn about the Islamic Republic’s military secrets. 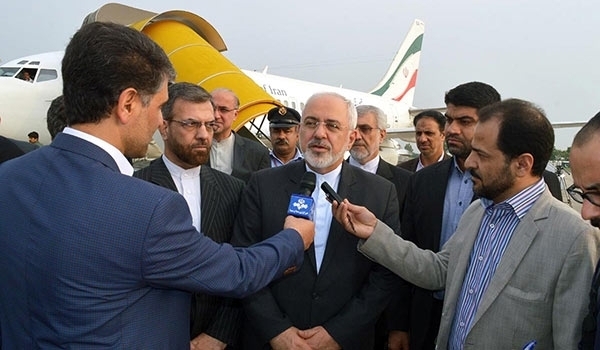 Iranian Foreign Minister Mohammad Javad Zarif said that upon arrival in the Russian city of Sochi on Wednesday in reaction to Amano’s recent remarks about inspection of Iran’s military sites, adding “the manner of IAEA’s inspections has been clearly stated both within the Additional Protocol as well as the framework of the JCPOA. “Iran and Russia need further coordination against US policies toward the JCPOA,” Zarif stressed. “One of the regional issues that must always be considered as a case of cooperation with friendly and neighboring countries is Syria,” Zarif said, adding that one of the goals of his visit to Russia is further coordination between the two countries for fighting terrorism in Syria.